Sri Surya Sakthi Solutions Private Limited SRI SURYA SAKTHI SOLUTIONS PRIVATE LIMITED is founded by a group of electrical engineers with vast experience in the field of electricity generation and distribution, engaged in integration of solar power plants.SRI SURYA SAKTHI SOLUTIONS PRIVATE LIMITED has been incorporated as a private limited company on 21st February 2013, and started its journey as SOLAR POWER PLANT INTEGRATOR and registered with TEDA (Tamil Nadu Energy Development Agency). To express our commitment towards the mission, our Directors had training at MSME in DESIGN AND DEVELOPMENT OF SOLAR PV PANEL AND ASSOCIATED PRODUCTS in JANUARY 2013. We at SRI SURYA SAKTHI SOLUTIONS PRIVATE LIMITED, have committed it as a mission to SOLARISE the State, as our social responsibility/ obligation. An off-grid can be stand-alone power system or mini-grids typically to provide a smaller community with electricity. Off-grid electrification is an approach to access electricity used in countries and areas with little access to electricity, due to scattered or distant population. It can be any kind of electricity generation. 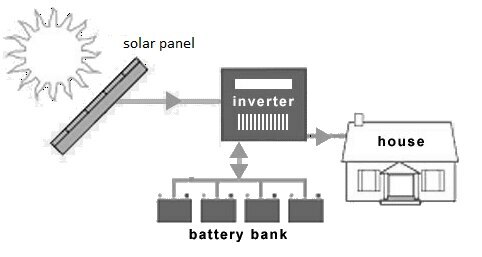 The term off-the-grid (OTG) can refer to living in a self-sufficientmanner without reliance on one or more public utilities. > Power will be available for limited period even in the absence of grid supply. > Back up depends on size of the battery. > More space and attention required. > Battery maintenance is a cumbersome process. > Replacement of batteries once in 3yrs. > Generation loss, due to charging and discharging of batteries. > Cost of the system will be more comparatively.